The Annapurna Circuit is a trek within the Annapurna mountain range of central Nepal.The total length of the route varies between 160–230 km (100-145 mi), depending on where motor transportation is used and where the trek is ended. The trek rises to an altitude of 5,416m on the Thorung La pass, touching the edge of the Tibetan plateau. This trek crosses two different river valleys and encircles the Annapurna massif, crossing Thorung La (5416m/17769 ft), the highest pass on this trek. Practically all trekkers hike the route anticlockwise, as this way the daily altitude gain is slower, and crossing the high Throng La pass is easier and safer. The mountain scenery, seen at close quarters includes the Annapurna Massif (Annapurna I-IV), Dhaulagiri, Machhapuchhre, Manaslu, Gangapurna [7455m/24459 ft] and Tilicho Peak (7134m/23406 ft). Numerous peaks of 6000-8000m in elevation rise from the Annapurna range. The trek begins at Besisahar or Bhulbhule in the Marshyangdi river valley and concludes in the Kali Gandaki Gorge. Besisahar can be reached after a seven-hour drive from Kathmandu. The trail passes along paddy fields and into subtropical forests, several waterfalls and gigantic cliffs, and various villages. Annapurna Circuit has often been voted as the best long distance trek in the world, as it combined, in its old full form, a wide variety of climate zones from tropics at 600 m as to the arctic at 5416 m as at the Thorong La pass and cultural variety from Hindu villages at the low foothills to the Tibetan culture of Manang Valley and lower Mustang. Continuing construction of a road has shortened the trail and changed the villages. [clarification needed] With construction of the road, mountain biking is becoming popular, with Mustang in particular is becoming one of the world’s most popular mountain biking destinations. The trek usually takes about 15–20 days, leaving from Kathmandu with a stopover in Pokhara before returning to the capital. The trail is moderate to fairly challenging and makes numerous river crossings over steel and wooden suspension bridges. Tea houses and lodges along the circuit are available for meals and accommodations. Some groups may opt for tents but these are typically only for those destined for side trips away from lodges such as climbing a peak. Welcome at the Tribhuvan International Airport and transfer to hotel in Kathmandu. Rest at the hotel and briefing about the trip. Overnight accommodation is set with BB Plan. Day 02: Rest, sightseeing, preparation, assignment and briefing. a half day city tour in and around Kathmandu Valley to make you live touch with the monuments, temples and monasteries such as durbar square, Pashupatinath, Bouddhanath or Swoyambhunath etc. and provide you leisure time for rest and preparation for next trip to Annapurna Circuit Trek and evening briefing at your hotel or at the office. Your overnight accommodation is set in BB Plan at same Hotel. The day begins with drive to Besisahar – Bhulbhule about 5-6 hrs from Kathmandu along to the Prithwi highway. We divert off the highway at the bustling town of Dumre and continue for a further one and half hours to Besisahar. After lunch we complete the short drive to the road head at Bhulbhule (846 meters) in the Marysandi Valley, overnight at lodge/teahouse with dinner. Commence trek to Shange begins after having breakfast and the walk about 5-6 hrs as an easy start and then a taste of things to come – the climb up to Bahun Danda, a picturesque village at the top of this formidable ridge. Then it’s down, across terraces and over small streams, before rejoining the Marsyangdi and following it upstream for several km to our overnight camp with teahouse/lodge in full board near the village of Shange. A wonderful walk with such changes in scenery and a range of gradients is begins today. From Tal we head across the river and ascend steeply to finally reach the ridge top high above. We cross another suspension bridge before a continued ascent up a narrow and beautiful valley where, after rain, many spectacular waterfalls will flow. Just before camp at Tal the first village in Manang, we come over a small rise and enter a wide, flat valley with a long, silvery waterfall to the right. We make a trail verse crossing a wide, flat valley. The trail then climbs a stone stairway to 1860m till another stairway. The journey continues making up and down to Dharapani at 1890m. There we find a stone entrance Chorten typical of the Tibetan influenced villages from here northwards. We then visit the Bagarchhap at 2160m that offers the typical flat roofed stone houses of local Tibetans design although the village which is still in the transition zone before the dry highlands. With often rough and rocky, the trail climbs to Tyanja at 2360m, and then continues through forest, but near the river, to Kopar at 2590m. As we reach the Chame, the headquarters of the Manang district, we are rewarded by the fine views of Annapurna II as you approach Chame and two small hot springs by the town. From Tukuche the trek begins today downward walk along the Kaligandaki river beach with a trail of motor able road or if tired on self payment basis you can ride a bus or jeep up to Ghasa where your overnight accommodation is set. River beach with a trail of motor able road or if tired on self payment basis you can ride a bus or jeep up to Ghasa where your overnight accommodation Ghorepani. Early morning trip to Poonhill (3232m.) to enjoy the sunrise view over Mt. Dhaulagiri , Tukuche Peak Nilgiri, Varaha Shikhar , Mt. Annapurna I , Lamjung Himal and other numerous snowcapped mountain peaks of Annapurna and Dhaulagiri ranges. After breakfast trek to Nayapool with 4-5 hours with lunch on the way from where you are taken to Pokhara by one hour private vehicle driving to Pokhara over night Pokhara. We will drop you to the International Airport (TIA) to assist you for your final departure to your home or alternatively the next destination. Pickup and drop international airport. 2 night 2/3star hotel in Kathmandu BB. Kathmandu to Beshishir / Pokhara to Kathmandu via Bus . Nayapool to Pokhara Via car one hour and 20 minute drive. Trekking guide/potter and – guide/potter salary, insurance, equipment, flight, food and lodging. Half day sight seeing kathmandu. Depending on the speed of the trekkers, number and length of side trips and rest days taken, acclimatization, weather and where the trek is finished, hiking the Annapurna Circuit can take anything from 8 to 25 days. Many trekkers short on time choose to fly out from Jomsom Airport, which shortens the trek by 6 days compared to the original AC. It is also possible to continue from Ghorepani to Tadapani, Ghandruk, Landruk and then to Phedi, which follows the old Annapurna Circuit from the time when the road was not yet extended to Beni. This more faithful variation takes three days instead of the shorter one-day exit from Ghorepani to Pokhara outlined above. A popular addition to the AC is a visit to Annapurna Base Camp, ABC (also called Annapurna Sanctuary). This trail turns to the north from Tadapani and rejoins the old AC at either Ghandruk or Landruk. A visit to the ABC adds about 5 days to the duration of the Annapurna Circuit, slightly less than the normal trek duration to ABC, as trekkers coming from the AC are already acclimatized and “trail hardened”. It is recommended that trekkers take the high trail from Pisang via Ghyaru and Ngawal to Manang, as the views are spectacular and the two villages along the route are some of the best preserved samples of Tibetan style villages still in their original state. Sleeping in either of these villages assists with acclimatization, as they are located already higher than Manang. Another side trip gaining popularity is the visit to Tilicho Tal, a lake. There are now lodges along the trail and near the lake at so-called Tilicho Base Camp, so tents are no longer required. If one wishes to cross to Jomsom via the Tilicho route, outdoor camping (and thus a tent) is required. At certain times of year, snow conditions can make the crossing dangerous or prevent it altogether. While much of the Himalayas cannot be trekked in the wet season, much of the Annapurna circuit actually sits within a rain shadow. This means that it is possible to trek most parts of the circuit all year-round, including the monsoon period. Trekking in the wet season is often encouraged as hikers avoid the crowds that plague the summer months. However, the days are often damp and many of the views are obscured by cloud. This is the most popular hiking season in Nepal. Due to the recent monsoons, everything along the circuit is refreshed, clean and vibrant. Views are usually clear and the night sky is extremely visible. Though the weather is generally warm, nighttime temperatures drop below freezing. This is the busiest period on the circuit and tea houses book up very quickly. This is the coldest period on the circuit. Depending on the altitude, day time temperatures will be cold and night time temperatures drop well below freezing. The trade off is that the trails are much less busy. Thorung La Pass, which stands at over 5,000 meters, is often blocked with snow and may be closed for days on end. Unless the snow blocks most trails, tea houses still remain open during this period. Clouds prevail more frequently, but clear days are still common. Towards March the rhododendrons start flowering, which brings hill sides alive with flaming colours. Unfortunately, this period is also when avalanches are most common. 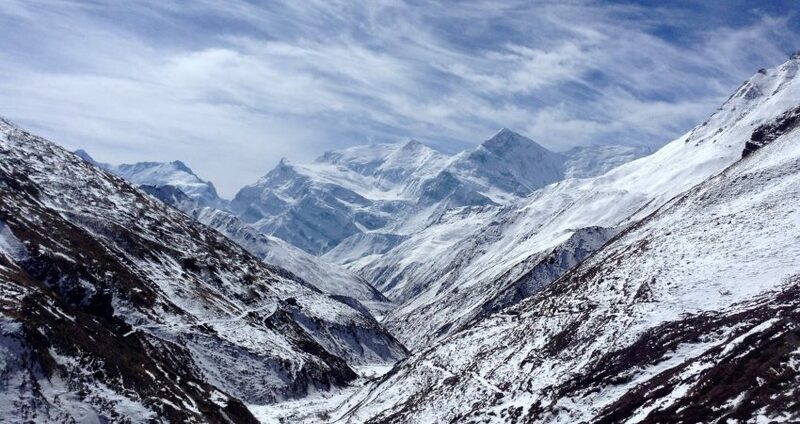 Because of the warming weather, April to May is the second most popular trekking season on the Annapurna Circuit. Most of the snow has dissipated, leaving crystal clear skies. There is often a strange haze that can be seen from the lower altitudes during May. However, this soon passes and cannot be seen from higher up the trail. As the monsoon period builds towards the end of May, the days become hotter and more humid which makes trekking at lower altitude quite uncomfortable. This is the monsoon period. Although there are stories of torrential downpours, mudslides and hordes of leeches, this is rarely the case on the Annapurna Circuit, particular the northern section. Whilst the south section of the Annapurna Circuit near Pokhara does get a lot of rain, the northern parts often receive less than 10% of the precipitation due to the location within a rain shadow. The upside of trekking in the monsoon period is that many of the flora species flower during this period, making the trek exceptionally beautiful. This is also the time when the Tilicho Lake side trek is relatively easier. The Annapurna area was opened to foreign trekkers in 1977 after the disputes between CIA backed Khampa guerrillas operating from the area into Tibet, and the local populace and Nepal army were settled. The original trek started from the market town of Dhumre situated at the Kathmandu – Pokhara highway and ended in Pokhara, and took about 23 days to complete. Road construction started in early 1980s both from Dhumre to the north and from Pokhara to the west and then up the Kali Gandaki valley. The road has now reached Chamje on the Marsyangdi river valley and Muktinath on the Kali Gandaki side. Of the trek’s original 23 days, only 5 walking days of the trek are now without a motor road. In places new trails and routes have been marked so that the road can be partly avoided. The existence of the road has nevertheless changed the area, appearance, and atmosphere of the villages. The road facilitates transport, increasing the popularity of mountain biking in the area. Since 2011, companies in Muktinath and Jomsom rent out mountain bikes to tourists. As the road sees very little traffic, and one can ride downhill (dirt road and/or single track) from Muktinath to Tatopani and descend almost 3000 meters in 2–3 days. New areas near Annapurna have been opened for trekkers in the past years, such as Upper Mustang, Naar-Pho Valley, Manaslu and Tsum Valley. Currently, trekking these areas is restricted and subject to extra permits, costs, and other limitations. Multiple locations of the trek circuit now have an Internet connection. This multi-district circuit’s trekkers can use wireless internet across different districts like in Kaski, Myagdi, Lamjung and Mustang. Cellular 3G is also available at some locations.